Waking and skating flies for Steelhead: What, Why, How, When, and Where. What is waking or skating flies for steelhead? Waking or skating flies for steelhead require a surface presentation employing the down and across swing to present a dry fly. 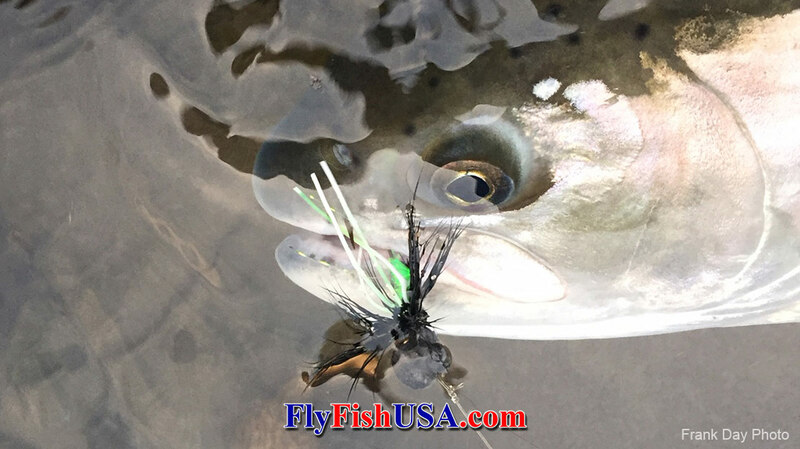 The fly is cast quartering across the current in the same manner as a wet fly, but rides the surface as it comes across leaving a V-shaped wake trailing behind it. The angle of the cast across the current varies with the speed of the current, and the temperature of the water. As a rule the angle of the cast increases as the water speed slows. This means that faster warm water needs more of a down-stream cast, and cooler slower water needs more of a cross-stream cast. Why wake flies for steelhead? Fishing a waking fly for steelhead can be tremendously exciting. 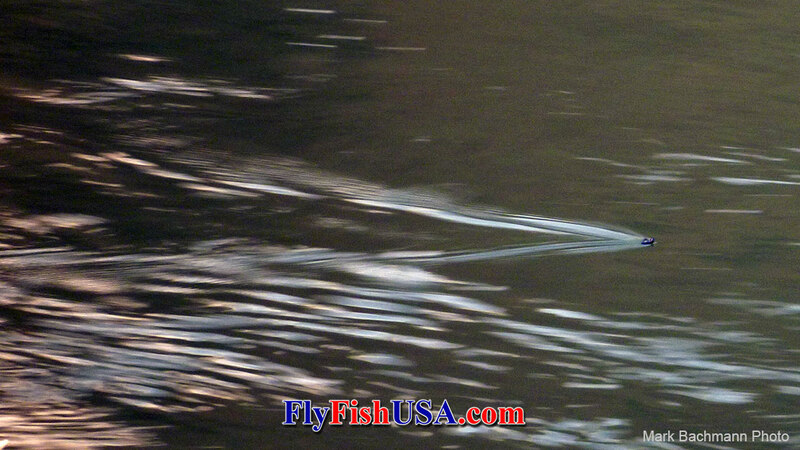 Steelhead that come to a waking dry fly are often quite aggressive making big showy rises. Sometimes the more robust fish become completely airborne in an attempt to sink the fly with their body before returning a second time to slurp your fly. They exhibit smolt-like behavior chasing down your fly with reckless abandon rising on it multiple times before finally taking. Many consider this to be the epitome of the anadromous fly fishing sport. Fishing surface flies can be tremendously challenging but also extremely rewarding. There are also a few other reasons to consider fishing surface flies. One of the chief reasons I fish waking flies is that even if the fish doesn’t take, he shows himself and gives away his position. Knowing where a fish is lying and even simply seeing a fish not only gives you the ability to then go catch that fish, but I find it often renews my angling confidence when fishing is tough. Another reason to fish waking flies is that you can see the action of your fly. You can view its speed and make the necessary adjustments to alter its course to your liking. This is phenomenally educational in teaching an angler how to present a swung fly and gives a huge advantage when you’re fishing wet. How to wake flies for steelhead. Waking dry flies for steelhead is exactly the same as fishing a wet fly, but your fly is on top of the surface instead of under it. The simplest approach is to cast downstream and across on a 45-degree angle and allow the current to carry your fly to the inside. A steelhead may rise on the fly several times through the swing. When you see the fish break the surface keep your cool. Let him do his thing, don’t pull your fly away. Once he decides to eat your fly, and your reel begins to turn you can lean into him. Sometimes a fish will rise and refuse several times before seemingly disappearing. Often times the fish is still there but has gotten bored with your fly. If you change to a smaller or drabber fly sometimes the fish will rise again. Some anglers will go through multiple fly changes before the fish finally takes, so it’s good to have a bit of variety in fly size and selection. We call this a “comeback fly program”. Think of it like a plan A, B, C, D, and E.
The tackle is much the same as your standard summer steelhead wet fly set up. You can use single hand rods, switch, or Spey rods. For a single hand set up 10’ 7-9 wt rods are pretty hard to beat. A standard weight forward fly line or a floating shooting head set up with a 9’ tapered leader will perform well. For switch rods, shorter Skagit heads such as Airflo’s scout or OPST commando heads paired with a floating MOW tip or a Scandi short will fish well. A 9’ tapered leader or a 10’ floating Polyleader will get the job done. For Spey rods your standard Scandi head will work just fine. If you are in the crowd who enjoys longer lines, mid-bellies and long bellies will work fine but be advised that some of the larger, more air resistant foam type flies may not turn over as well. A 9’ tapered leader or 10’ floating Polyleader is perfect for Spey rods up to 13’. If your rod is longer than 13’ you can use a 14’ Polyleader if you choose. When should you use waking flies? 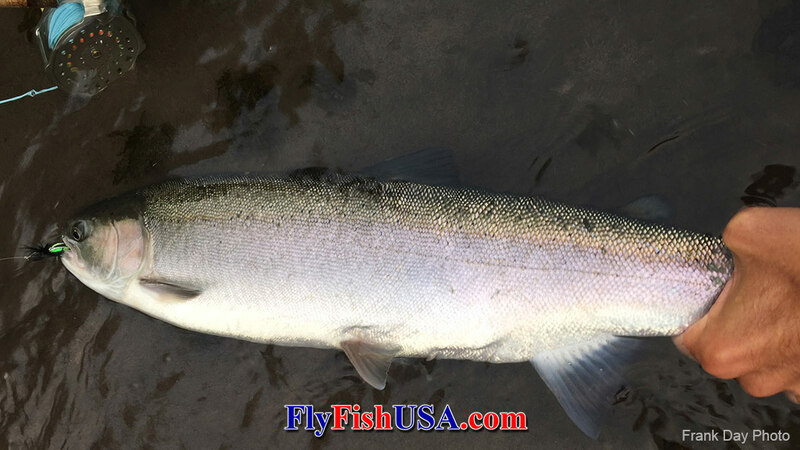 Most steelhead that are taken on a floating line and waking fly are done under summer water conditions. Most anglers agree that when water temperature is 50 degrees or above they can confidently fish a waking fly. In very warm or colder water steelhead become lethargic and are much less likely to move the necessary distance to take a fly from the surface. Water from 47 to 64 degrees is ideal. However, there are times during cool water periods where steelhead will take waking flies. 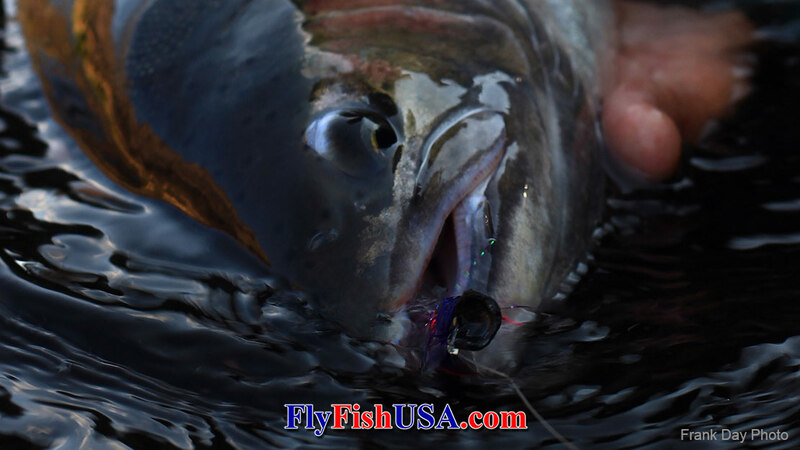 It seems that if water temperature increases enough in a short period of time that a steelhead will take a waking fly. For example if you were fishing the Deschutes in early December and water temperature was 35 degrees in the morning but spiked to 45 by mid-afternoon it would be worth considering throwing a waking fly. There are also a few other factors to consider other than just water temperature. Time of day is of concern. Waking flies are usually the most effective during low light periods such as morning and evening. When the sun is on the water it’s more difficult for fish to see a waking fly, especially if the sun angle is such that it is directly overhead or in front of holding fish. That’s not to say that fish will not take waking flies during the day in full direct sunlight. Anomalies happen every day if you give them the chance. Waking flies are best fished anywhere summer steelhead swim. Your favorite summer steelhead river is a great place. Regardless of whether it’s a “sink tip” river or not, summer steelhead are summer steelhead and they’d love to eat a waking fly if you give them a chance to do so. Waking flies are best fished in softer water. Classic waking fly water is often a smooth tail out with even speed where the V of your fly’s wake is clearly visible on the surface. For depth 2-4’ is ideal. If the fish doesn’t have as far to rise to take your fly he’s that much more likely to do so. Whether it’s out of convenience, curiosity, or annoyance is anybody’s guess. Fishing waking flies although classically a first and last light practice, can be done in the midday. If you’re a diehard and all you want to do is wake dry flies you don’t have to stop just because the sun is up. Target choppier broken water. The sun doesn’t penetrate like it would in smoother water. The steelhead looking up are less apt to be blinded by the sun. Fly selection can help as well. Fishing a larger fly with a broader more visible silhouette can up your odds.